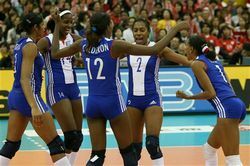 Cuba's women's volleyball team will represent the North, Central American and Caribbean region (NORCECA) in Japan 2010 World Championships. Cuba defeated Guatemala 3-0 at the in Havana and won the best team and most valuable player titles through Yanelis Santos, while junior team member Wilma Salas was best offensive player and best service. Trinidad and Tobago scored a 3-1 win on Nicaragua to end second and Guatemala is third. Cuba will soon attend the traditional Boris Yeltsin cup from June 28 to July 3 in Russia.